Today I walked past a vine where back in early October I saw a caterpillar which looked like it had two heads. Each end of the caterpillar looked like a black head with white spots. The caterpillar, which is called a Turbulent Phospila (Phosphila turbulenta), has a whole lot of black and white pinstripes with a bit of yellow on its sides just above its legs. Here is a photo of the caterpillar of a Phosphila turbulenta on a Greenbrier vine. 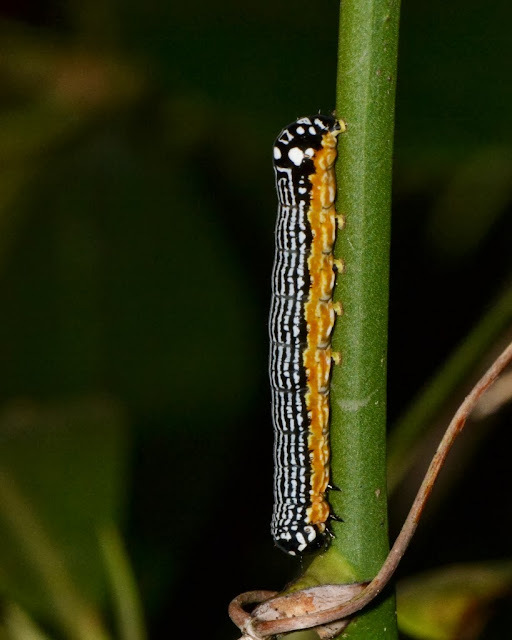 Notice the upper end (the fake head end) is swollen and has white spots and markings to make it look almost exactly like the caterpillar's real head. A head on each end... I wonder if bird's brains can figure out which end is up? I suspect a fake head could give the caterpillar a fighting chance should a bird choose to peck its hinder end instead of its head. I wish now that I would have acted bird-brained and "pinched" the wrong end just to see if this caterpillar was chemically defended in some way. As smartly colored and brightly patterned as the caterpillar is, I suspect it is chemically defended and therefore distasteful to birds. It follows that they have little need to hide... perhaps that is why I spotted the caterpillars as I was walking trail. 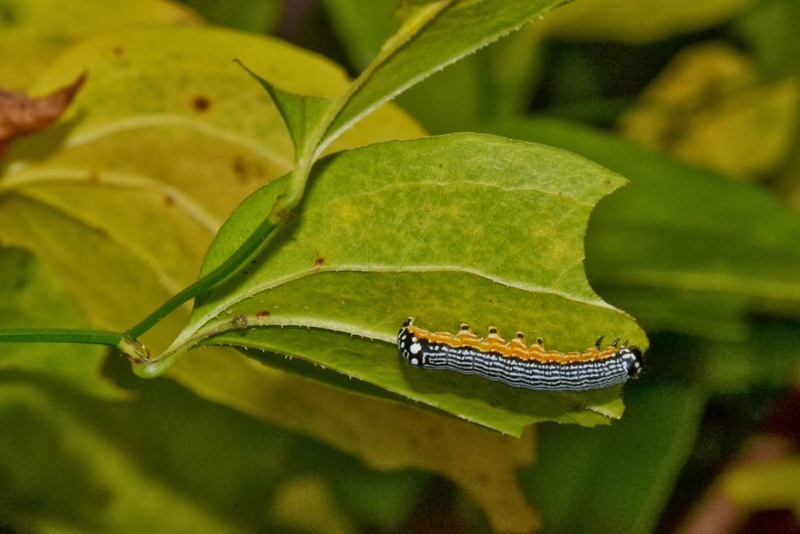 The photo below shows another Turbulent Phosphila caterpillar that was feeding on a leaf elsewhere on the same Greenbrier vine. In fact, there were many of these gregarious caterpillars scattered around on the Greenbrier vine. When the caterpillars were young they would have been feeding on the Greenbrier in close proximity to each other - feeding in groups - probably for safety in numbers. As they grow they must wander off on their own, at least on their preferred host plant, the Greenbrier. In the photo below, you can see I pulled the leaf slightly apart to reveal a pupating Turbulent Phosphila. 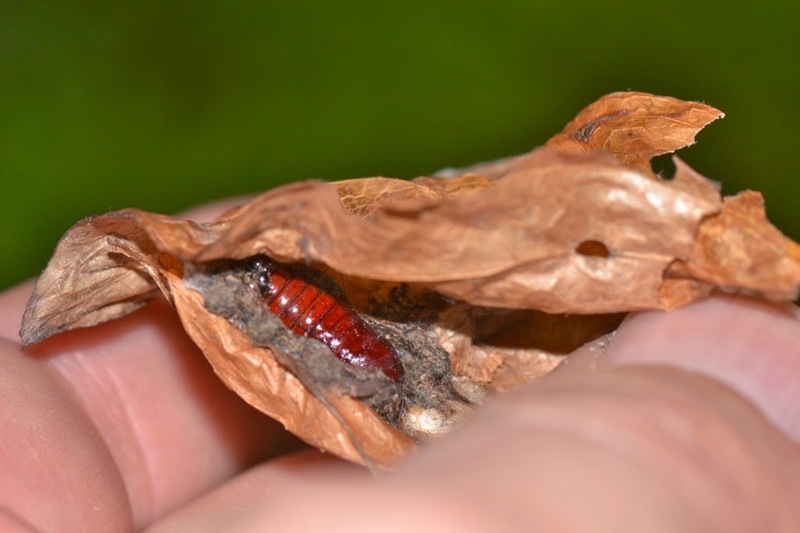 Within the enclosing leaf the pupa was encircled with a ring of silk and "junk" which formed a "cell" or partial cocoon. 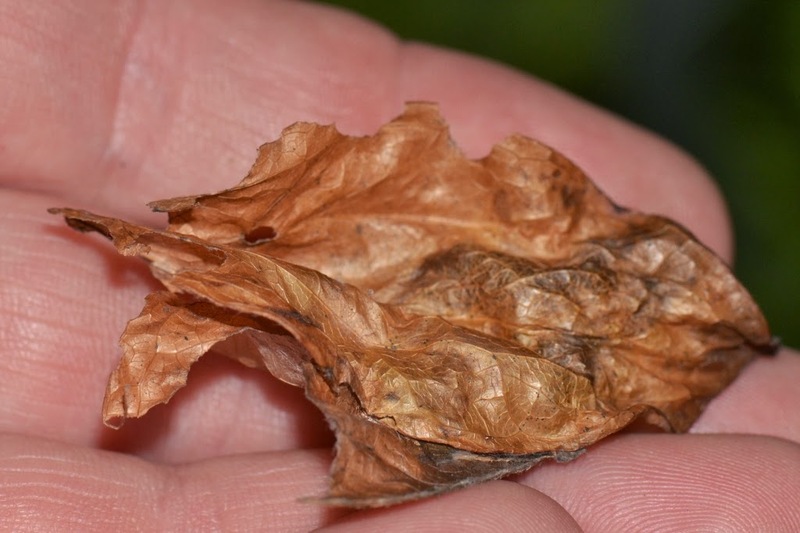 Barring unfavorable environmental conditions, predators, or parasites, that pupa should turn into a rather nondescript, camouflaged, grayish-brown moth come spring. I think I have a photo of one of these moths that I had taken last spring but can't seem to find it... too plain-looking, eh? On the same Greenbrier vine as these caterpillars I also noticed a little pile of trash that was moving... there was a tiny trash collector sidling along the vine. Can you tell that I, like always, didn't get very far on my nature walk? Oh well, that little creature will make the subject matter of my next post and so we will continue this nature walk/field trip on a vine with tiny camouflaged trash collectors hiding out nearby where flashy, pinstripe-wearing "two-headed" Turbulent Phosphila caterpillars are feeding contentedly. Yes, blogging is a good bit of work. It takes me a lot of time to write good content and take the photos I use. I started blogging a few years ago and simply learned as I went. I used the Blogger platform, but I’m considering using a new blogging platform which should make it simpler to incorporate video and mobile blogging on my site. Click on this link, then enter your email there to watch the free videos (takes a few days to get all of them)…. there is real good information there! If you “dig deep” in that site, you will find helpful stuff for getting traffic to your website, for promoting your products online, and even for blogging.